There are no photos with those IDs or post 24590 does not have any attached images! 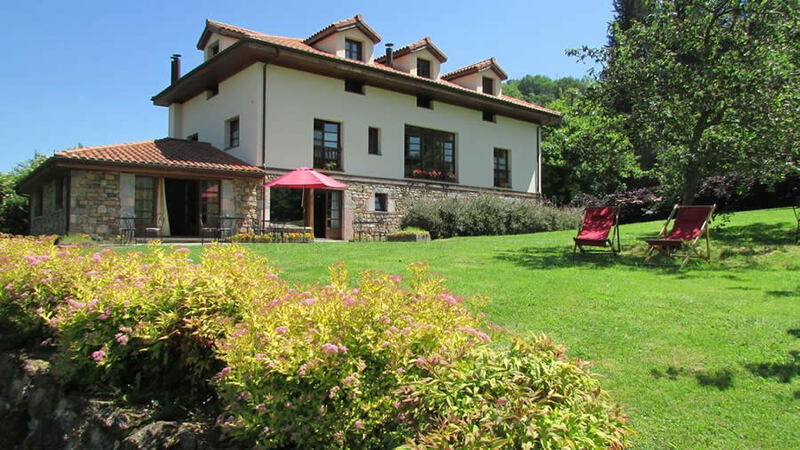 We welcome you to our Rural Hotel in Asturias, Casa de La Veiga where we invite you to enjoy a unforgettable stay in the authentically natural environment. On the ground floor there is the reception, kitchen, common bathrooms, large dining room of 53 square meters for breakfasts and dinners and the living room of 48 meters with fireplace, library and board games, both with direct access to the garden. On the first floor there are four Comfortable rooms doubles with balcony and on the second floor, five other bright double rooms with sloping ceilings. We offer you rooms with a double bed of 1,80 or with two 0,90 beds, dressed with anti-mite quilts and white linen. All rooms are exterior, around the 18 square meters of surface, flat screen TV, with full bathroom, some with bathtub and others with shower, hair dryer and host products. At the Hotel we offer breakfast service and dinners as well as a cafeteria bar for the exclusive use of our guests. Once in OVIEDO and following the highway, follow the direction GRADO - LA ESPINA (A-63) and then (about 5 km.) The exit 9 TRUBIA. A SAMA DE GRADO is accessed by the AS-313 road whose start is on the right, once crossed the town of TRUBIA with direction PROAZA and PUERTO VENTANA (AS-228).